Visitors to a national park could soon be ‘flattening its hills’ with the help of electric bikes to help ease the strain on the muscles of getting up its gradients. The Yorkshire Dales National Park Authority is looking for businesses willing to act as hiring and charging centres for the electric bicycles, which already operate in two other English national parks. The national park bosses said they hoped businesses would be able to boost their takings by participating in the Dales Electric Bicycle Network. Kath Needham, the authority’s sustainable tourism officer, said: “Many people who enjoy cycling but who are not super fit may dismiss biking in the Dales as too challenging. “But electric bikes are great for ‘flattening’ hills – giving visitors the chance to choose a green form of transport on which to enjoy this fantastic but fragile countryside rather than in a car. “From a business owner’s point of view, hiring out bikes or acting as a charging point can be a great commercial opportunity. 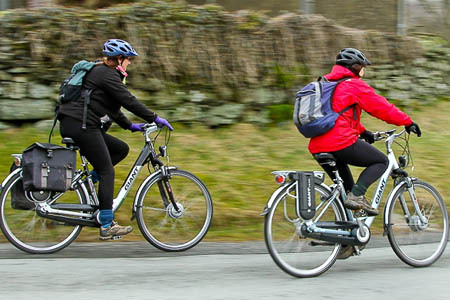 “Following on from successful launches last year in the Lake District and the Peak District national parks, we are now looking to launch the Dales Electric Bicycle Network to cover our National Park and beyond. “But, for it to be a success, we need to hear from businesses in the Dales who can see the potential and want to know more. “The bikes appear to be a real draw to visitors and if, for example, you offer accommodation, they could be a reason why guests pick your place to stay over others. She added: “The next stage will be for the Electric Bicycle Network – the company that set up both the national parks projects – to bring a couple of the bikes around the area, in order that those interested can have a go and see what they think. This will also be a chance for them to ask questions about the scheme. The DITA Connecting the Dales project funding extends beyond the Yorkshire Dales national park boundary, as far as Richmond, Bedale, Ripon, Harrogate, Ilkley, Skipton, Settle, Bentham, Kirkby Lonsdale and Kirkby Stephen. How about electric skates for walkers! April fools day was 3 days ago surely ! !